This article is about the Michael Jackson song. For the concept in Jewish moral philosophy, see Tikkun olam. (1992) "Give In to Me"
"Heal the World" is a song recorded by American recording artist Michael Jackson from his eighth studio album, Dangerous (1991). It was released in 1992 as the fifth single from the album. It was written and composed by Jackson, and produced by Jackson and Bruce Swedien. 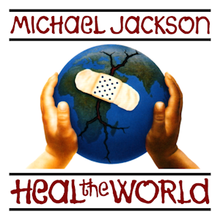 In a 2001 Internet chat with fans, Jackson said that "Heal the World" is the song he was most proud to have created. He also created the Heal the World Foundation, a charitable organization which was designed to improve the lives of children. The organization was also meant to teach children how to help others. This concept of 'betterment for all' would become a centerpiece for the Dangerous World Tour. In the documentary Living with Michael Jackson, Jackson said he created the song in his "Giving Tree" at Neverland Ranch. An ensemble performance of "We Are the World" and "Heal the World" closed Jackson's memorial service at the Staples Center in Los Angeles on July 7, 2009. The song was performed as rehearsed by Jackson at the venue just weeks earlier, in preparation for his planned "This Is It" concerts in London along with "Dirty Diana". R&B singer Ciara sang the song as a tribute to Jackson at the 2009 BET Awards. The song was played at the funeral of James Bulger, and Jackson also donated the song to be used as the anthem for the charity the James Bulger Red Balloon Centre, a school for children to go to if they are being bullied or have learning difficulties. This song is written in the key of A major, and it spans from E4 to C#6. It has a tempo of 80 beats per minute. The song reached number two in the UK Singles Chart in December 1992, kept off the number one position by Whitney Houston's "I Will Always Love You". It peaked number 27 on the Billboard Hot 100. AllMusic editor Stephen Thomas Erlewine called this song "middle-class soft." David Browne of Entertainment Weekly praised the song: "And when his voice isn't competing with drum machines, it has rarely sounded stronger-achingly pure on Heal the World," Rolling Stone's Alan Light was not satisfied, calling it "a Hallmark-card knockoff of "We Are the World." The music video (directed by Joe Pytka) features children living in countries suffering from unrest, especially Burundi. It is also one of only a handful of Michael Jackson's videos not to feature Jackson himself, the others being "Cry", "HIStory" and "Man in the Mirror". (The clips for "HIStory" and "Man in the Mirror" only feature Michael Jackson in archival footage). The version of the video included on Dangerous: The Short Films and Michael Jackson's Vision contains an introductory video that features a speech from Jackson taken from the special "spoken word" version of the track. This version was not included on Video Greatest Hits – HIStory featuring the music video. Jackson performed the song in the Super Bowl XXVII halftime show with a 35,000 person flash card performance. Leif Bloms recorded the song on 1993 album Dej ska jag älska all min tid. Connie Talbot, a finalist from Season 1 of Britain's Got Talent, released a variation of the song in November 2011 on her album, Beautiful World. In 2016 Mumbai-based folk music duo Maati Baani (formed by Nirali Kartik and Kartik Shah) released a cover of the song featuring 45 child artists between the ages of 5 and 13 from India, South Africa, Russia, Canada, Japan and the United States, displaying an eclectic array of musical styles. ^ Smallcombe, Mike (November 27, 2016). "The making of Michael Jackson's Dangerous PART ONE". Retrieved June 18, 2017. ^ Miles, Tina (October 8, 2009). "Michael Jackson's Heal The World released to support new Liverpool James Bulger centre for bullied children". Archived from the original on October 16, 2009. . Liverpool Daily Post. ^ Hamilton, Julian (June 6, 2009). "'Heal The World' song launched for Red Balloon Centre in Liverpool". Archived from the original on February 22, 2012. . Click Liverpool. ^ "Heal the World By Michael Jackson – Digital Sheet Music". MusicNotes.com. Sony/ATV Music Publishing. Retrieved September 27, 2012. ^ Erlewine, Stephen Thomas. "Michael Jackson – Dangerous". AllMusic. All Media Network. Retrieved February 15, 2014. ^ Browne, David (November 29, 1991). "MUSIC REVIEW – Dangerous (1991) – Michael Jackson". Entertainment Weekly. Retrieved February 15, 2014. ^ Light, Alan (January 1, 1992). "Michael Jackson – Dangerous". Rolling Stone. Retrieved February 15, 2014. ^ Heal the World (Music Video). Epic Records. YouTube. Retrieved July 6, 2009. ^ a b "Australian-charts.com – Michael Jackson – Heal The World". ARIA Top 50 Singles. Retrieved February 15, 2014. ^ a b "Austriancharts.at – Michael Jackson – Heal The World" (in German). Ö3 Austria Top 40. Retrieved February 15, 2014. ^ a b c d e f "Ultratop.be – Michael Jackson – Heal The World" (in Dutch). Ultratop 50. Retrieved February 15, 2014. ^ "Top RPM Adult Contemporary: Issue 1841." RPM. Library and Archives Canada. Retrieved February 15, 2014. ^ "Top RPM Singles: Issue 1825." RPM. Library and Archives Canada. Retrieved February 15, 2014. ^ "Hits of the World". Billboard. Vol. 105 no. 6. February 6, 1993. p. 46. ISSN 0006-2510. ^ a b "Lescharts.com – Michael Jackson – Heal The World" (in French). Les classement single. Retrieved February 15, 2014. ^ a b c "Offiziellecharts.de – Michael Jackson – Heal The World". GfK Entertainment Charts. Retrieved March 19, 2016. ^ a b "The Irish Charts – Search Results – Heal the World". Irish Singles Chart. Retrieved February 15, 2014. ^ a b "I singoli più venduti del 1993" (in Italian). Hit Parade Italia. Creative Commons. Retrieved February 15, 2014. ^ "Nederlandse Top 40 – Michael Jackson - Heal The World" (in Dutch). Dutch Top 40. Retrieved February 15, 2014. ^ a b c "Dutchcharts.nl – Michael Jackson – Heal The World" (in Dutch). Single Top 100. Retrieved February 15, 2014. ^ a b "Charts.nz – Michael Jackson – Heal The World". Top 40 Singles. Retrieved February 15, 2014. ^ a b "Norwegiancharts.com – Michael Jackson – Heal The World". VG-lista. Retrieved February 15, 2014. ^ a b "Swedishcharts.com – Michael Jackson – Heal The World". Singles Top 100. Retrieved February 15, 2014. ^ a b "Swisscharts.com – Michael Jackson – Heal The World". Swiss Singles Chart. Retrieved February 15, 2014. ^ "Official Singles Chart Top 100". Official Charts Company. Retrieved February 15, 2014. ^ a b c "Dangerous – Awards". AllMusic. All Media Network. Retrieved February 15, 2014. ^ "Michael Jackson Chart History (Hot 100)". Billboard. Retrieved May 27, 2017. ^ "Michael Jackson Chart History (Hot R&B/Hip-Hop Songs)". Billboard. Retrieved May 27, 2017. ^ "Michael Jackson Chart History (Pop Songs)". Billboard. Retrieved May 27, 2017. ^ "CASH BOX Top 100 Pop Singles – Week ending MARCH 20, 1993". Archived from the original on October 10, 2012. . Cash Box magazine. ^ Halstead, Craig; Cadman, Chris (2003). Michael Jackson the Solo Years. Authors On Line Ltd. p. 103. ISBN 978-0-7552-0091-7. ^ "Forum – ARIA Charts: Special Occasion Charts – CHART POSITIONS PRE 1989, part 2". Australian-charts.com. Hung Medien. Archived from the original on September 29, 2013. Retrieved February 15, 2014. ^ a b "Italiancharts.com – Michael Jackson – Heal The World". Top Digital Download. Retrieved February 15, 2014. ^ a b "Spanishcharts.com – Michael Jackson – Heal The World" Canciones Top 50. Retrieved February 15, 2014. ^ "50 Back Catalogue Singles – 18/07/2009". Ultratop. Hung Medien. Retrieved February 15, 2014. ^ "Danishcharts.com – Michael Jackson – Heal The World". Tracklisten. Retrieved February 15, 2014. ^ "Top 100 Music Hits, Top 100 Music Charts, Top 100 Songs & The Hot 100". Billboard. Retrieved February 20, 2012. ^ "lescharts.com – Français" (in French). Les classement de telechargement single. Retrieved December 30, 2009. ^ "Top 100-Jaaroverzicht van 1992" (in Dutch). Dutch Top 40. Archived from the original on April 14, 2014. Retrieved February 15, 2014. ^ "Jahreshitparade 1993" (in German). Austriancharts.at. Hung Medien. Retrieved February 15, 2014. ^ "Jaaroverzichten 1993" (in Dutch). Ultratop. Hung Medien. Retrieved February 15, 2014. ^ "The RPM Top 100 A\C Tracks of 1993". RPM. Vol. 58 no. 23. December 18, 1993. Retrieved May 19, 2016. ^ "Jahrescharts – 1993". Offiziellecharts.de (in German). GfK Entertainment Charts. Archived from the original on May 9, 2015. ^ "Jaaroverzichten – Single 1993" (in Dutch). Single Top 100. Hung Medien. Retrieved February 15, 2014. ^ "Schweizer Jahreshitparade 1993" (in German). Hitparade.ch. Hung Medien. Retrieved February 15, 2014. ^ "I singoli più venduti del 2009" (in Italian). Hit Parade Italia. Creative Commons. Retrieved February 15, 2014. ^ "ARIA Charts – Accreditations – 2009 Singles". Australian Recording Industry Association. ^ "Les Singles / Titres Certifiés "Argent"" (in French). InfoDisc. Retrieved May 19, 2016. ^ (in French) "Les Singles en Argent". Archived from the original on May 29, 2014. . Infodisc. ^ "Gold-/Platin-Datenbank (Michael Jackson; 'Heal the World')" (in German). Bundesverband Musikindustrie. ^ "NZ Top 40 Singles Chart – 06 JULY 2009". NZ Top 40. Retrieved February 15, 2014. ^ "British single certifications – Michael Jackson – Heal the World". British Phonographic Industry. Select singles in the Format field. Select Gold in the Certification field. Type Heal the World in the "Search BPI Awards" field and then press Enter. ^ "Dej ska jag älska all min tid / Leif Bloms" (in Swedish). Svensk mediedatabas. Retrieved October 12, 2014. ^ "Beautiful World – Single". iTunes. Retrieved February 23, 2013. ^ Joshi, Sonam (August 31, 2016). "45 Kids Got Together For This Cover Of MJ's 'Heal The World' And It's Sheer Brilliance". The Huffington Post. Retrieved September 2, 2016.